Pro-Vice-Chancellor Professor Gail Gillon shares some exciting news from the College of Education, Health and Development. Our University Council has approved the new name for our building on Ilam campus. The building will be called “Rehua” – the bright summer star associated with wellness. The naming of this building follows the recent approach of naming key buildings at the heart of campus, Matariki, (the Registry) and Puaka, the James Hight library. Ngāi Tūahuriri and Ngāi Tahu confirmed that they are keen to ensure that the mana of Te Ao Māori is reflected at the heart of campus and that the two “pou” represented by Registry and James Hight are the appropriate representations of this. The name Rehua was recommended to Council as a link to the two pou already established. Matariki, the name of the Pleiades star cluster and also of the season of its first rising in late May or early June—taken as the beginning of the New Year. Puaka, the brightest star in the constellation Orion, which rises at about the same time as Matariki is also associated with the start of the New Year. Rehua is spoken of as a chief among stars. It is associated with wellness, healing and leadership, as well as the bright star in the sky to signal the start of summer. The Council also approved that the innovative learning space (our “show case” new teaching space on the building entry level floor) be called The Beeby Centre of Innovative Learning and Teaching. This centre is named after Clarence Beeby ONZ CMG, 1902- 1998, (UC Alumnus), one of New Zealand’s most distinguished educational thinkers, who was the first director of the New Zealand Council for Educational Research and then Director of Education (Ministry of Education) (see Appendix for details). Our new building, Rehua, is due for completion at the end of August, 2017, and we are planning on shifting into the building in early October, next year. Below is the hidden trap in recording your notes in someone else’s calendar meeting, or in a recurring meeting. Has this happened to you? You have been writing notes in your individual Outlook calendar appointments, which have been created by someone else (and you are an Invitee), or which are recurring meetings created by you or by someone else. All good? Well yes – in itself that’s a brilliant method of keeping the notes for a meeting close to hand, until the author/owner of the meeting or series (who could even be you) changes something and updates the meeting or the whole series and suddenly all your notes are gone. Permanently. All of these scenarios lead to you losing the notes you have recorded under each individual appointment. The solution? Don’t do it. Record you your notes somewhere else. Check out our Archive of Tech Tips – hit the “End” key on your keyboard to jump to the end of the list, where the most recent Tips are. To check it out, click here. The footbridge between University Drive (opposite the University Bookshop) and the UCSA building is now closed as construction work is ramping up in the area. Detour signs are in place. 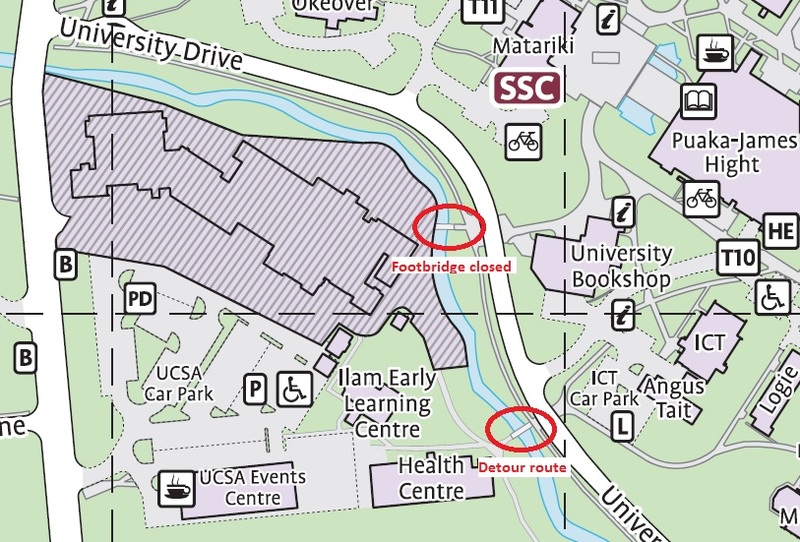 Please use the footbridge between University Drive (opposite the ICT carpark/Angus Tait building) and the Health Centre instead. Take care and look out for others when using this footbridge – cyclists and skateboarders please slow down.